Leg Bags W/ Comfort Strap and Twist Valve Drainage Port. These sturdy bags are latex-free and have a sterile fluid pathway. Leg bags are 19oz or 600ml. This is a great price on something we buy a lot of for my dad. Very good quality as well. twist valve are easiest. twist valve does not snag. long car journeys. on the golf course. Retired, . twice a week golfer, . The easiest location is on the inside of your calf, if you are right handed it is probably easier to work the straps and the valve,with the bag on your left leg. the twist valve is small in diameter and does not get caught on clothing items, during bathroom visits like some of the lever type. The straps could be a little wider to reduce the bite on the leg if your muscles are not what they used to be. Twist valves are extremely tough to open/close after a few uses. They do the job for now . They crumple up too much . Could be sturdier . These aren't bad but aren't great either. Wish they were a little better built, they tend to leak a bit. Husband seems to not like them much but then again we haven't found anything better yet. Could be that the ones he received after his hospital stay (they sent him home with two bags) were better quality bags and that's what he's looking for. 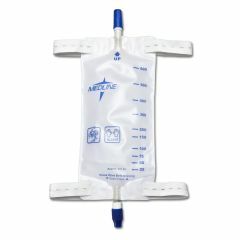 what is the length and width of the 19oz 600ml catheter leg bag? Product number is 560963. I have a catheter caddy. I need to check if it fits into it. Thank you.